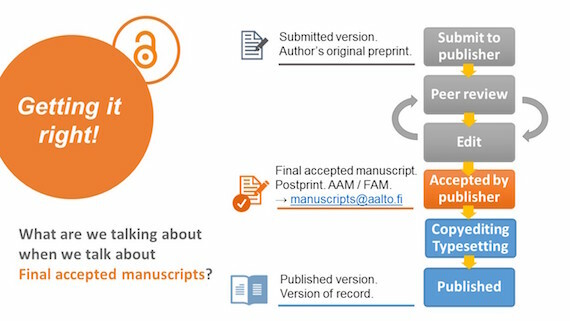 Aalto University wants to promote the open availability of research articles. All the scientific peer-reviewed articles and conference publications will be deposited to ACRIS as a service by RIS Open Science and ACRIS team. ​Who’s affected? - Every Aalto University author who is publishing scientific articles and conference publications. This includes PhD students and PostDocs. Which version do I send? - You should send your final, peer-reviewed accepted manuscript (FAM). This is a version WITHOUT the official layout, or corrections made in copy-editing or in typesetting. Provide us the manuscript with the pictures and charts included. How is it done? – Tell about the university policy to your coauthors in the start of the writing process. As soon as your peer reviewed manuscript has been accepted, send it to manuscripts@aalto.fi. What about third party copyright? - Articles may also contain copyrighted material belonging to a third party, such as illustrations or graphics. If the permission to use these materials applies only to printed editions, separate permission is required to use them for self-archiving purposes. Do I need to send my manuscript if it is being published with paid open access? - You do not need to send the manuscript to us. We will deposit publications published with paid open access as a part of our publication importing service. Can I upload manuscript myself to ACRIS? – Yes you can, please see the instructions. The service staff will check the upload is according to publisher’s policy. File formats we accept – Please send only PDF files.